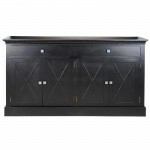 The Frejac Sideboard is a stunning piece for living and dining spaces. The cross front cupboards make the Frejac Sideboard a perfect fit for contemporary, Hampton’s or French interiors. Available in Black and Chalk.